1974. 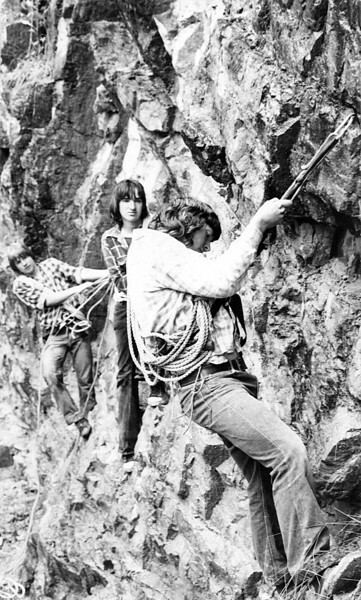 From left; Glenn Tempest, Philip Armstrong and Stephen Griffin (all about 15-years-old) testing out the rope they made in Glenn's back yard. They used thin nylon yarn spun between an electric drill and an egg-beater. Glenn's dad (Brian) then 'steamed' the 'rope' at his workplace at ICI Fibremakers in Bayswater (where the yarn was originally pinched from). This image was taken in a quarry just off the Maroondah Highway near Healesville. This same rope was used on many early climbs including Glenn and Philip's first ever 'real' climb when they did Xanthene (17) on the North Jawbone. The rope was still in regular use by Glenn's dad (tying down loads on his trailer) up until 2012.